The most convenient time for most of us to observe the planets is in the early evening. With that in mind, I’ve prepared an ephemeris of favorable evening times to view each of the eight major planets of the solar system over the next ten years. Some interesting patterns emerge, which I will comment on. With the exception of Mercury, what follows is a range of dates when each planet is at least 10° above the horizon at the end of evening twilight at latitude 43° N. Mercury, however, is never even above the horizon at the end of evening twilight. Here is a list of dates when Mercury is highest above the western horizon at the end of evening civil twilight. Mercury, the innermost planet, whips around the Sun every 88 days (116 days relative to the Earth—its synodic period). It never strays more than 28° from the Sun. As you can see in the graph below, Mercury is presently highest above our evening twilight horizon when it reaches greatest eastern elongation in April, and lowest in October. Similarly, greatest eastern elongations that occur in the constellations Taurus and Aries present Mercury highest above our evening twilight horizon, and Libra, the lowest. Now, let us turn to Venus. Unlike Mercury, Venus usually spends a considerable number of days well above the horizon near greatest elongation. 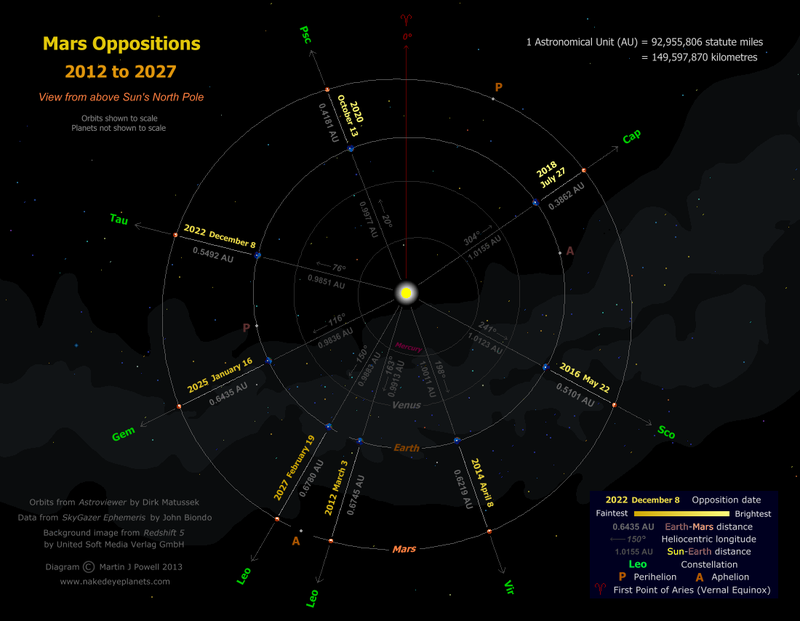 This occurs because Venus orbits further from the Sun—reaching a maximum angular separation of 47°— and because its orbital period is only 140.6 days shorter than the Earth’s: the Earth “keeps up” with Venus reasonably well as the two planets orbit the Sun (the synodic period of Venus is 583.9 days), so it is a long time between successive elongations. In the next ten years, we will see Venus high above the evening horizon during only three intervals, though for a generous three or four months each time. Now, we turn to the superior planets: Mars, Jupiter, Saturn, Uranus, and Neptune. These planets are visible in our evening sky during and after opposition. Mars has the longest synodic period of all the major planets—780 days—so it takes an unusually long period of time for the orbital positions of Mars and the Earth to change relative to one another. Approximately every two years we get the opportunity to see Mars at least 10° above the horizon at the end of evening twilight. The number of evenings Mars is visible varies quite a lot (due to its significant orbital eccentricity): 293 evenings during the 2018 perihelic opposition of Mars, down to 145 evenings during the aphelic opposition of Mars in 2027. In any event, Mars spends a considerable amount of time during these intervals very far away from Earth and therefore disappointingly small in our telescopes. The best time to observe Mars is during the early weeks of the intervals listed below when Mars is at or near opposition. Jupiter orbits the Sun every 11.9 years, so it is easy to see why it is in a different constellation along the zodiac each year. The orbital periods of Saturn, Uranus, and Neptune are 29.5, 84.0, and 164.8 years, respectively, so we can see why they take a successively longer amount of time to traverse their circle of constellations. You’ll also notice that the interval of visibility shifts later each year, but the shift is less with increasing orbital distance. The synodic periods of Saturn, Uranus, and Neptune are 378.1, 369.7, and 367.5 days, respectively.